Cellphones and smartphones have become a mainstay in the lives of many Americans, and this has introduced new challenges into how users and non-users alike approach basic social norms and etiquette. People are sorting through new rules of civility in an environment where once-private conversations can easily be overheard in public places and where social gatherings can be disrupted by participants focusing on digital screens instead of their in-person companions. Some 92% of U.S. adults now have a cellphone of some kind, and 90% of those cell owners say that their phone is frequently with them. Some 31% of cell owners say they never turn their phone off and 45% say they rarely turn it off. This “always-on” reality has disrupted long-standing social norms about when it is appropriate for people to shift their attention away from their physical conversations and interactions with others towards digital encounters with people and information that are enabled by their mobile phone. It turns out that people think different kinds of public and social settings warrant different sensitivities about civil behavior. 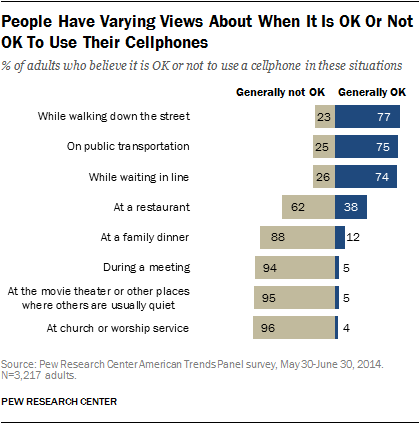 For instance, fully 77% of all adults think it is generally OK for people to use their cellphones while walking down the street and 75% believe it is OK for others to use phones on public transit. But only 38% think it is generally OK for others to use cellphones at restaurants and just 5% think it is generally OK to use a cellphone at a meeting. As a general proposition, Americans view cell phones as distracting and annoying when used in social settings — but at the same time, many use their own devices during group encounters. When asked for their views on how mobile phone use impacts group interactions, 82% of adults say that when people use their phones in these settings it frequently or occasionally hurts the conversation. Meanwhile, 33% say that cell phone use in these situations frequently or occasionally contributes to the conversation and atmosphere of the group. Women are more likely than men to feel cell use at social gatherings hurts the group: 41% of women say it frequently hurts the gathering vs. 32% of men who say that the same. Similarly, those over age 50 (45%) are more likely than younger cell owners (29%) to feel that cellphone use frequently hurts group conversations. When considering the impact of their mobile phone use on their own social interactions, 25% of cell owners say that when they use their phone in group settings, it takes at least some of their attention away from the group of people they are with at the time. In spite of this widespread feeling that cellphone use during social gatherings can be more of a hindrance than a help, it is almost universally the case that people use their own cellphones during these gatherings and observe other members of their social groups doing the same. 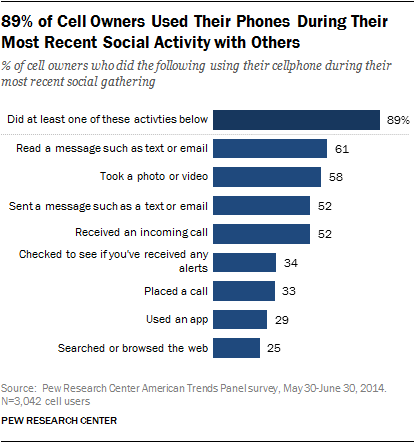 In this survey, cellphone owners are asked to think about the most recent social gathering they attended and what they did with their cellphone while they were in the physical presence of others. Fully 89% said that they themselves used their phone during their most recent time with others, and 86% report that someone else in the group used their cellphone during the gathering. When asked about some specific ways they might have used their cellphone during their most recent social gathering, a majority of cell owners indicated they used their phone to send or read a message, take photos or videos, or receive an incoming call. Fewer used their phones for such things as checking to see if they had any alerts, placing a call, using an app, or searching or browsing the web. In all, 89% of cellphone owners reported using their phone in at least one of these eight ways during their most recent social gathering. In addition to asking how these individuals used their mobile phones during their most recent social gathering, the survey also included a follow-up question asking what those users are hoping to accomplish by using their phone. As it turns out, a share are trying to avoid or disengage from the people they are physically present with: 16% used their phone because they are no longer interested in what the group was doing; 15% wanted to connect with other people who are strangers to the group; and 10% used their phone to avoid participating in what the group was discussing. 45% used their phone to post a picture or video they had taken of the gathering. 41% used their phone to share something that had occurred in the group by text, email or social networking site. 38% used their phone to get information they thought would be interesting to the group. 31% used their phone to connect with other people who are known to the group. In all, 78% cited at least one of these four “group-contributing” reasons, compared with 30% who used their phone for one of the three “retreating-from-the-group” reasons. Constant mobility is also changing the ways in which Americans can interact with information and other people while outside the bounds of explicitly “social” settings. Indeed, many cellphone owners are using their mobile devices while out in public for a variety of reasons, and while their visible actions might seem rude or inconsiderate to an outside observer, in many instances they are using their phone to further their social engagement with others. 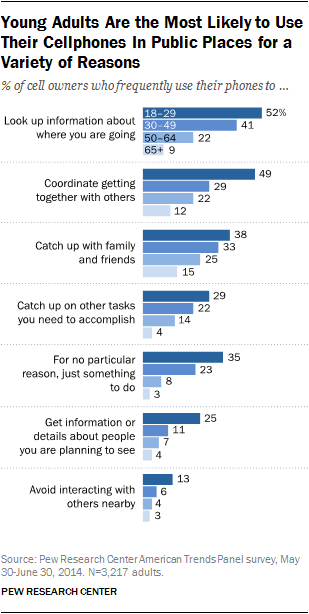 catching up with family and friends: 67% do that frequently or occasionally. Many also report using their phones to pass the time or catch up on other tasks or to get information about the people they are planning to see, but these activities are less frequent. Explicitly anti-social behavior while in public is considerably less common. 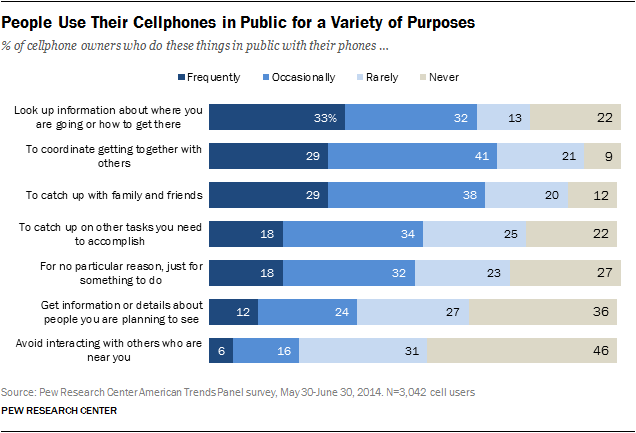 Some 23% of cellphone owners say that when they are in public spaces they use their phone to avoid interacting with others who are nearby at least on occasion. Of course, those around the cellphone user may still experience various uses of cellphones as anti-social, even if that was not the intention of the user. Those ages 18 to 29 stand out from their elders on virtually every aspect of how mobile activities fit into their social lives, how they act with their phones and their views about the appropriateness of using phones in public and social settings. Younger adults are more engaged with their devices and permissive in their attitudes about when it is OK to use a mobile phone. Of course, older adults, especially senior citizens, are generally less likely than younger adults to own a mobile phone in the first place and are also less likely to use their phone for activities other than voice calls. This might be a factor in some of these differences. It is important to note, though, that Americans of all ages generally trend in the same direction about when it is OK or not to use cells in public settings. Fully “public” venues are viewed by all age groups as generally acceptable places to use one’s cellphone, while usage in quiet or more intimate settings is mostly frowned upon by all. Along with being more tolerant than their elders about cellphone use in public, younger adults also tend to use their phones for a wider range of purposes while out and about in public. For instance, 52% of cellphone owners ages 18 to 29 say that they frequently use their phone to look up information about where they are going while out in public, compared with 9% of cell users 65 and older who do this frequently. Similarly, 49% of younger cell users say they frequently use their phone to coordinate getting together with others while they are out and about, compared with just 12% of seniors. Young adults who have cellphones are also more likely than seniors to have used their cellphone during their most recent social gathering. Fully 98% of young adults used their cellphone for one reason or another during their most recent get-together with others, compared with 69% of cell owners 65 and older. Data in this report is drawn from Pew Research Center’s American Trends Panel, a probability-based, nationally representative panel. This survey was conducted May 30, 2014 through June 30, 2014 among 3,217 adults, including 3,042 cellphone users. The margin of error on the full sample is plus or minus 2.2 percentage points and for the cell-user sample is 2.3 points. For more information on the American Trends Panel, please see the Methods section at the end of this report and these further details about the panel’s construction, composition and maintenance.